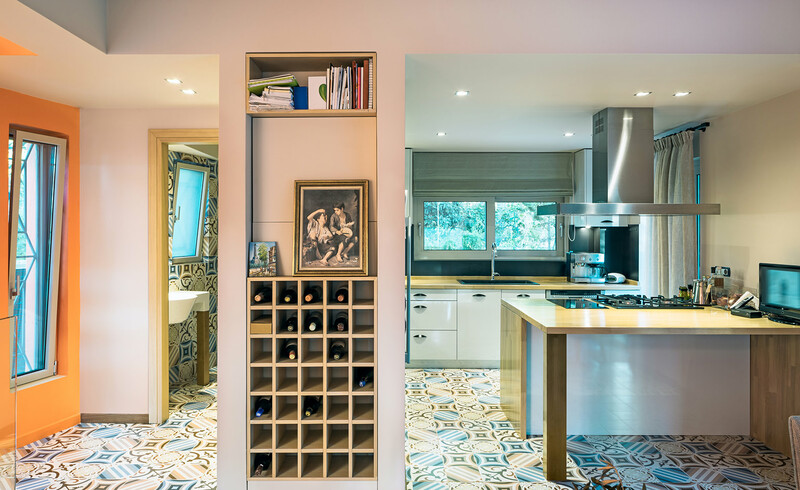 A new house built on a sloped plot of land in the north-eastern suburbs of Athens is a playful response to the classic Rubik’s Cube. Building the house with blocks of colour, Kipseli Architects added a whole new dimension to a tall family house on a narrow plot. Inspired by the adventurous nature of her client, a young family man whose favourite film is Star Wars, Kipseli’s principal Kirki Mariolopoulou designed a colourful spaceship that was fun, yet also functional. The house, with its eccentrically soaring atrium and expansive four-storey facade, provides the perfect canvas for an abundant use of an intense orange colour scheme, flooding a tropical warmth from the front door to the roof terrace. Pops of bright blue furniture, shiny red bathroom tiles and green and yellow walls in the bedrooms define moods and spark conversations throughout the home. 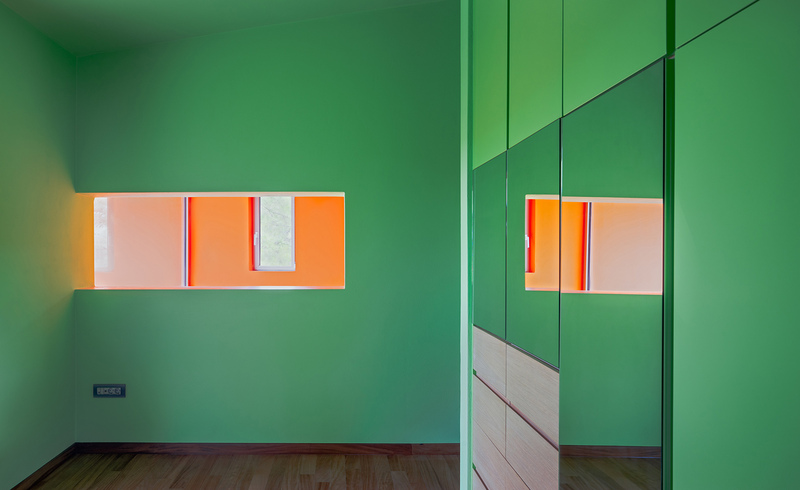 Using such vivid colours on this scale was a first for Mariolopoulou: ‘For me every new housing project is a new relationship. As we all know, every new relationship comes along with its unique experiences and challenges. The main challenge this time was how architecture can evolve through the abundant use of bold colours,’ she says. The architecture of the house is just as dynamic as the colours that adorns it. The narrow trapezium plot forced Mariolopoulou to think laterally, planning the house on a vertical axis and skewing the northern facade towards the west to catch the sun, extending it further to anchor the atrium and enclose the entrance and the stairway. Floating wooden stairs were connected to a glass rail running up through the space, allowing for the reflection and flow of light and colour through the house. ‘The design feature that stands out the most for me is the staircase, which also affects the whole design quality of the house. The aim was to create a triangle-shaped lightweight staircase that is developed as the north wall unfolds to the side, like an experiential sculpture piece,’ says Mariolopoulou.